I am generally torn when it comes to my favorite defunct bands reforming. Sure, I am as easily swayed by nostalgia as the next guy, if not more so. But I am also keenly sensitive to the concepts of legacy and expectation, and we all know what can happen to the former if you miss the latter. And so it’s with cautious optimism that I’ve been waiting for the return of The Likely Lads. The Libertines have been maybe my favorite band of the last 15 years. They personified so much of what I love about music: Punk attitude with smart lyrics and even smarter melodies, all wrapped up in a dream of Albion. 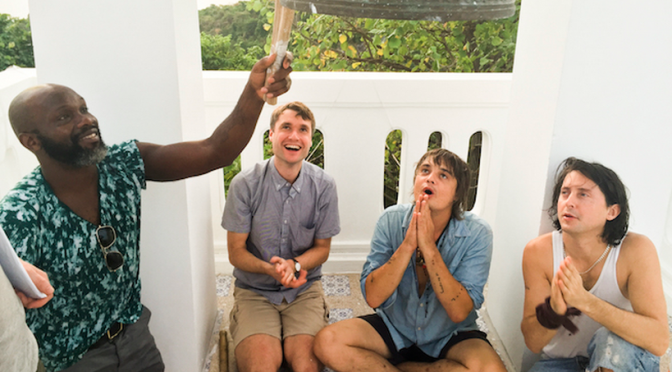 Today marks the beginning of the test with the release of a new video and song, “Gunga Din,” which is somewhat appropriate in the context of the relationship between Peter Doherty and Carl Barat. The Rudyard Kipling poem of the same name is about an English soldier in colonial India and his water carrier, who eventually sacrifices his own life to save the soldier…despite abuse. Without getting too analytical about it, let’s just say the two have had swings of abuse and intense love over the years that seems to have returned to a place of genuine appreciation, respect and brotherly affection. The video finds our heroes stumbling and sweating their way through crowded streets in what I am guessing is Thailand, where the band wrote most of the new album as Doherty was completing a stint in rehab. The 12-track record will be titled Anthems For Doomed Youth and comes out on September 4. Info on the various version is available on the band’s website.